Councillors on the City Plans Panel overwhelmingly backed the controversial Park & Ride Scheme at Stourton at their meeting today (24 January 2019). The scheme will see parking for 1200 cars on land between Hunslet Cemetery and Junction 7 of the M621. The site will be served by electric buses running into the city centre via Hunslet Road, which will be modified to create a dedicated bus lane. 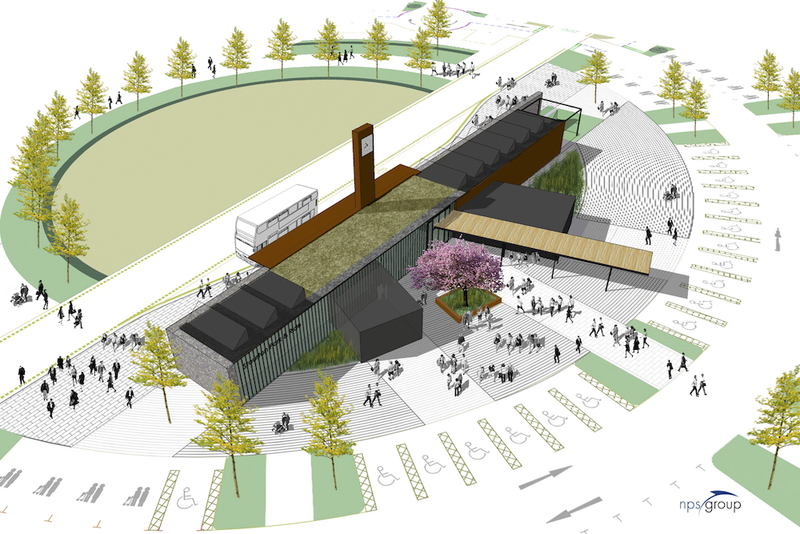 The planning application had been agreed in principle at a Panel meeting earlier this month, but Councillors had asked for more details and changes to the landscaping and the terminal building. Councillors heard that the landscape planting will include ‘woodland edge’ dense planting of trees, shrubs and hedging by the boundary with Hunslet Cemetery; combined with ‘woodland buffer’ planting of larger trees between the boundary and the parking area. The trees would be 2-3m when planted and grow to 20-30m tall over time. The terminal building will host a Changing Spaces disabled toiled, green walls, a mix of green roof and solar panels to create a ‘saw tooth’ profile – referencing many older industrial buildings in South Leeds. Speaking against the plans, local resident Martin Fitzsimmons asked for details of parking restrictions on nearby residential streets and said that ground surveys showed the land wasn’t suitable for building on. He said consultation with the public had been poor throughout the process and asked for the decision to be adjourned until the revised plans had been consulted on. John Leggett from developers WSP said the report Mr Fitzsimmons referred to dated back to 1975 after the open cast mine had been back filled. Recent surveys showed that there were various solutions and that sound foundations could be constructed. Highways officers explained that all the junctions around the site including between the M621 slip road and the A61/A639; and every junction on the existing gyratory would have traffic lights to ensure a safe flow of traffic. Cllr Cohen expressed concerns about noise so close to the cemetery, but officers said that whilst the additional planting would not significantly soften noise from the site, noise from the Park & Ride would be lower than the background noise from traffic on the motorway. The latest revisions to the plans are subject to further public consultation, but the scheme will only come back to Plans Panel if a new substantive planning objection is raised during that consultation. Otherwise Councillors voted to “defer and delegate” the decision to planning officers would agree the fine detail with the developer. “Park and ride is an important part of our Connecting Leeds programme, helping to make our transport network as fast, efficient, reliable, accessible and green as we can. “Park and ride in Leeds has proven to be an increasingly popular service that people want to use on a daily basis. It reduces traffic congestion and makes the air cleaner for us all, while giving commuters certainty about safe parking and relaxed ride in and out of the city. What have they ignored. The park and ride won’t create as much noise as the motorway that runs rite by the side of it and it won’t create pollution like the motorway is. If anything the graveyard will benefit frome new trees that will reduce the noise from the motorway. Pollution will only be reduced by taking traffic off the motorway.